Woo Hoo! Each time a piece of my art sells I feel great excitement that someone has appreciation enough to spend their money on it ... especially in this economy. 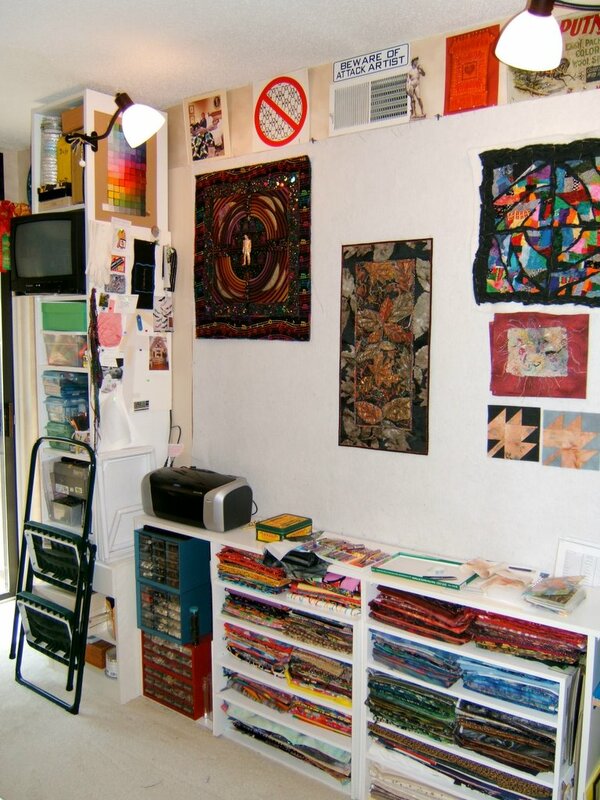 As I've stated in my sidebar, I don't make art or quilts to sell, but I do sell ... meaning I create whatever pleases me rather than what either I or a gallery owner/curator thinks will appeal to buyers. I realize how fortunate I am not to have to make a living from my creations ... that I have the freedom to go my own way. 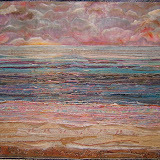 This piece sold from the Cliffdweller's Gallery on Glades Road in Gatlinburg, Tennessee. 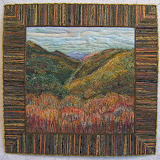 It, along with nine other quilts, have been there since my weekend in the mountains a few weeks ago. 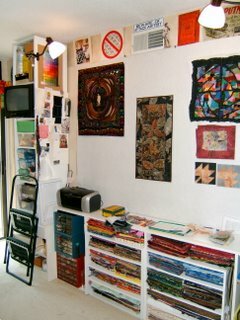 One of the owners knew of my work and requested that I bring quilts to present to her other five partners. 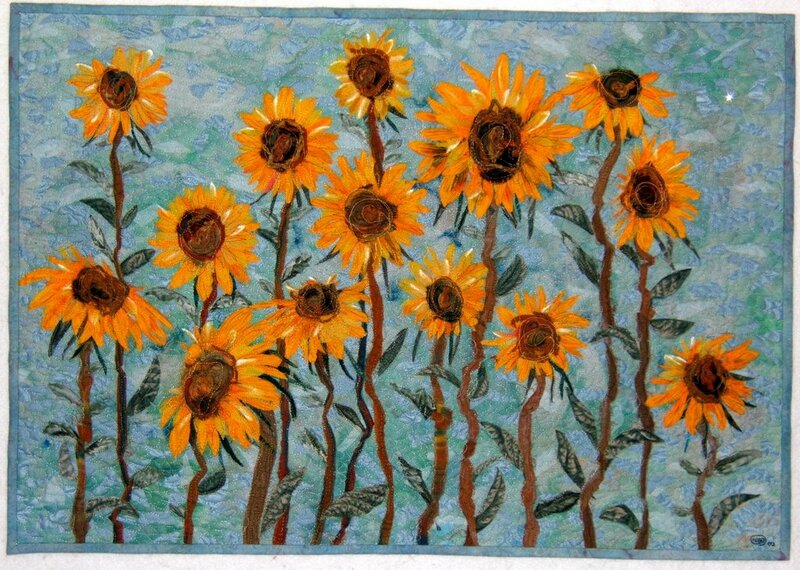 All of them enthusiastically accepted my art quilts to exhibit and sell in their gallery. 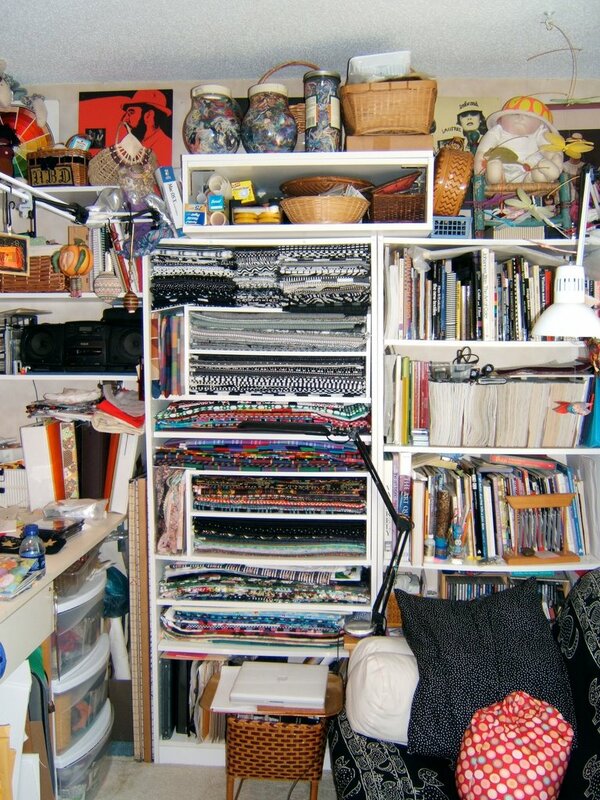 It pleases me that there are no rolled up quilts stashed away in my closets (except for the one that alternates on the wall in my living room with the other one I cannot bear to part with). 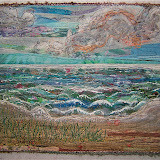 All my creations are hanging in galleries in Tennessee, Michigan, and Illinois. Woo Hoo! To read about my creating "Vincent's Flowers" go here. This pair of small birds is made from leather. Their head dresses are real feathers. The little ones are molted from the bird who lives next door. The long maroon one was shed from an art sculpture of a lady wearing a feathered hat. Their wings are lined with fabric that is printed with metalic gold. The male is more colorful with teal on his under tail. Hers is just gold. They were cut from an artist made leather neck piece. This hand-painted beauty was passed on to me by my friend, Alicia. 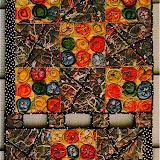 If you click on the photo you'll see the drawn pattern pieces and that there will hardly be any leftover scraps. Regrettably, neither of us looked good wearing it. She is getting it back to enjoy it in the form of these birds who will live in the Moroccan bird cage that hangs in her dining room. Shhhhhhh...it's her Christmas present. Lightly sprinkle talcum on the leather so it won't drag against the bed of the machine. Kristin who left a comment on my last post sent a photo of her fun bird. I especially like her positioning the eye in the center of the flower. I hadn't thought of making a black beak. These birds are destined to be Christmas gifts for friends. Three of them I made last spring. Although, they've each just gotten a head dress and a perch. The pink and black bird is new. It's made from a small piece of hand-dyed damask napkin that Deb had sent as part of her Pay It Forward gift to me. Can you spot it among all those hand-dyed goodies? This funky bird I call "Kramer" (as in the Seinfeld character) because of the wild, bold pattern in the fabric, the long gawky legs, and funky pompadour hair. He was gifted to my friend, Darlene, today at Bee. Here you can see those long legs and the pattern on his underside. This pretty bird was created by "Shasta". You can read about its creation on her blog. Shasta used regular wire for the legs and managed to balance this pretty bird in a standing position. I've suggested to her that the feet be perched on a piece of wood or some other object. All the birds I make are now perched on something. It's tricky to find each of their balance points to make them stand and I don't want to frustrate my friends with this chore. 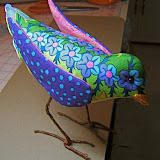 All the birds I've made and those shared with me by other people can be seen in this Picasa Web Album. Today I posed the small birds that are made to be ornaments outside in the Nandina bushes. If you look closely you'll see that glitter glue has been added to each one so they will sparkle in a Christmas tree. They have been posted about previously, but never all of them together in one picture. To make birds this size I reduced the pattern to 70 percent of the full sized one on a copy machine. Their legs are made with a 12" long thick craft pipe cleaner instead of the heavy wrapped floral wire. Everyday almost half the viewers of this blog get here because they either saw a link about my birds posted somewhere or they googled for a bird pattern. I wonder if there are as many birds being created "out there" as all this interest indicates. If you've made some, please share by sending me a link to photos or a post on your blog. If you're reading about them here for the first time click on the label "Birds" located at the end of this post to see many photos as well as to access a tutorial and the pattern. The side panel that had the leaf rubbings had begun to bother me. It was pulling my attention away from the square of pounded leaves. I thought it worked because the pattern is nebulous and secondary to the pounded leaf piece. Even though my eye came back to the focal point I felt there was too much pull. So, I began to think about other elements that would complement the leaves ... how about tree trunks? I got out stripy fabrics and auditioned. This one works well. It repeats the red tones in my two leaf fabrics and I like the gray blue stripes that look like glimpses of sky between tree trunks. The dragonfly strip looks better at the top ... after all they are flying, right? The bottom looked skimpy. One of the fabrics I had pulled from my stash for the side panel audition is a shaded dark batik. It makes a wonderful base for the composition and those glass leaves are showcased. This may be it. The natural pigments of leaves and flowers pounded into fabric are quite stable IF that fabric has been treated to retain dyes. 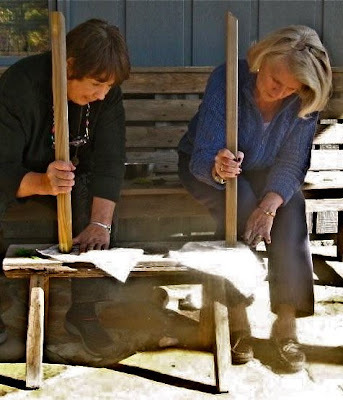 However, this project of pounding leaves in the Smoky Mountains was spontaneous and the only fabric I had was pre-washed muslin. Last evening I enhanced the piece by sketching around the leaves with a fine point permanent marking pen. Then I used oil stick pastels to lightly color the leaves. 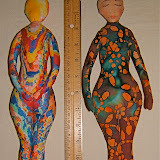 Before these additions I had heat-set the natural and paint pigments with a hot iron. Afterwards the ink and pastels were heat set. This is the piece with the oil stick rubbings of big leaves that will be used in the side panel of my leaf quilt. Here it is with the leaves enhanced. Again, I lightly sketched around each leaf and lightly colored in the leaf shapes with the metalic gold oil stick pastel ... then heat-set the added pigments. Now I'm auditioning which half will work best in the leaf quilt. 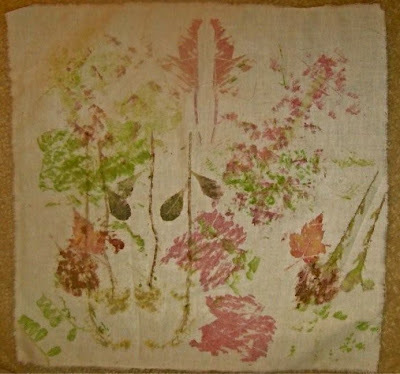 I would hesitate to use pounded botanicals in a project that requires washing even if they they were applied to treated fabric. Although, enhancing the natural pigments as I've done with inks and pastels definitely makes them more permanent. If anyone has washed a project with pounded leaves or flowers please leave a comment to let me and my readers know the result. This is the arrangement hanging on my design wall. I'm studying the proportions of the main section plus the angle of the newest piece with the pounded leaves that was begun in the mountains about a week ago. The dragonfly piece at the top is a strip of upholstery fabric given to me by a friend. The edging with glass leaves was another gift from someone who knows I like to use bits and pieces. Both of those are a bit longer than my arrangement so there's room for adjustment. The large piece with the black leaves is linen that I discharged a number of years ago. Real Maple leaves were scattered across it and then a strong bleach solution was spritzed over all. The bleaching action was stopped by immersing the fabric in a bucket of vinegar and water. At that time I discharged all the yardage I had of this linen with various patterns, some of which was used in "Come With Me to Kasbah". I love the copper color of the bleached areas. I had gone back to the store to purchase more, but it was GONE. The vertical rectangle is one of five pieces I fabricated a year ago. Here are the other four pieces. When we were in Memphis for Thanksgiving I had found wonderfully huge leaves with strong veins along the bank of the Mississippi River. They were too dry for pounding an image out of them so I did rubbings with oil paint sticks. 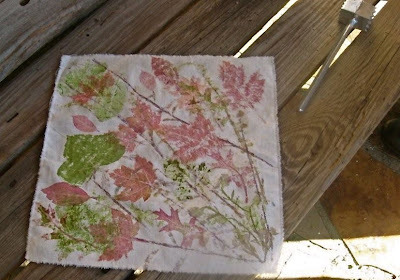 After heat setting the leaf images the fabrics were saturated with water, then each was crumpled in its own pie pan and dabbed with acrylic fabric paint and left to dry. This method allows most of the pigments to migrate to the peaks of the folds giving those wonderful natural lines. There's room for more manipulation in this process. I'm sure I adjusted those wrinkles after a day and spritzed more water for more pigment movement. All those pieces had been accumulating in pile for a year just waiting for the final element and the right moment to "become". 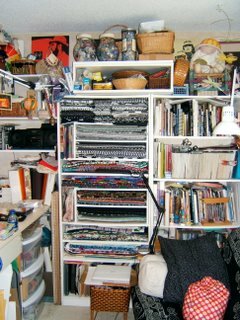 There are quite a few pieces from that pile not being used and I think they'll get put away to make room for the other piles of possible projects stacking up in my studio. ...and paper. A bit more about my process. I place the botanical between 2 layers of fabric (many times just folding over a single piece). The image from the underside of a leaf or petal is usually stronger. The best thing to use for pounding is a rubber mallet. Although, I've used a hammer and river rocks as well as that stick last weekend. I've also found it's best to pound on a smooth cutting board. I cover it with a plastic bag so as not to leave stains behind. I touch up the finished piece with crayons. Heat the fabric with an iron so the colors melt into the fabric rather than sit on top. Watercolor crayons and pencils would work well, too. I also have outlined the images with permanent pens. Heat set the natural as well as any added pigments to make them more permanent. Using "prepared for dying" fabric or treating it to retain dye would be best. Click here for an in depth article about the process that I just found through Google. Go here to see and read about other projects I've made with pounded flowers. Now, go have fun and wake up the neighborhood with your pounding. A week ago we were in the mountains with friends looking at this for the weekend. The leaves were at the peak of color and the weather was glorious. 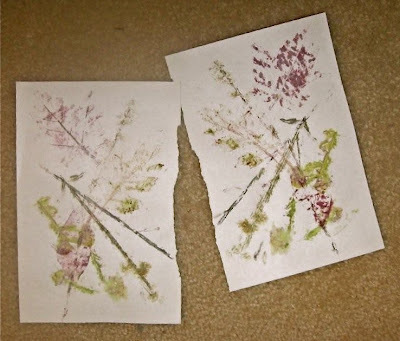 At some point during the weekend I talked about pounding leaves and crayon rubbings to one of my friends who recently became serious about making art. On our last afternoon she tapped me on the shoulder and told me she'd like to try pounding leaves. I just happened to have a couple of pieces of muslin in my go-everywhere project bag. Within a short time we had gathered some of those beautiful leaves, found some sticks, and were pounding away. All that tap-tap-tapping attracted observers, one who brought us a metal meat pounder from the kitchen ... the sticks worked best. This was the resulting image of leaves and weeds that I pounded out. When we got home I decided the background needed color. I thought if paint were brushed on the back side of the fabric the imprints wouldn't be disturbed. I was wrong and am sorry to have lost some of those wonderfully clear prints of the mountain leaves. The strong impressions you see on this piece are from leaves I pounded in from our trees at home. On the bright side, the additions of paint and leaf impressions made this a more complex cloth. This small square excites me and I feel nudged to create the leaf piece that's been brewing in the back of my mind for more than a year. You'll be seeing more of it. Today I'm featured on the Selvage Blog. 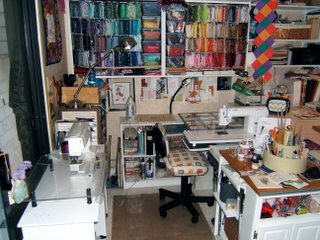 It's a site that presents quilts and other items made with or includes selvages ... you know, those edges of fabrics that so many people can't wait to cut off their yardage and throw away. 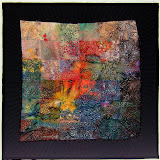 I'm there specifically because of the center (and focal) block created by Christine Copenhaver in my quilt "Come With Me to the Kasbah". Selvages and the trimmed away scraps or "orts" (as the British call them) are intriguing to me. Those of you who follow my blog know I collect them by bags full and they're the origin of a lot of my work. 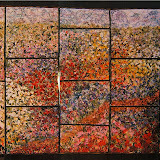 My "ortwork" collage quilts (click to see album) have selvages worked into them. Those with the most are the lake series. I went through all the lake piece photos to find one good example. 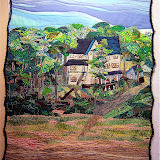 The selvages are difficult to spot because there is so much layering and twisting of pieces. My favorites are those that have a "fringed" edge because they have the look of spray shooting up from the top of a breaking wave. 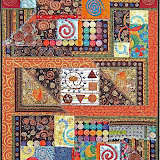 It's easier to spot the selvages within the compositions before the free-motion machine quilting is added. I sometimes wonder why I have shelves of folded big pieces of fabric when it's the bags of orts that I'm digging through so often. 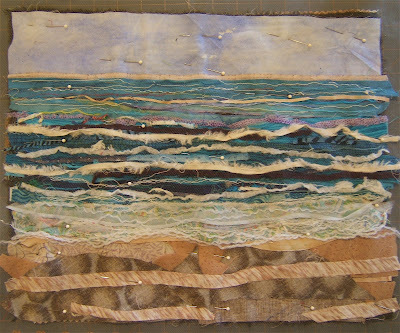 Well, there are times that I do need large pieces for borders and backings. 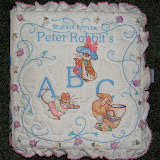 And then I do occasionally piece regular quilts . 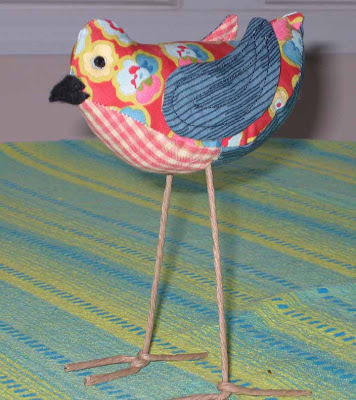 Most recently I've pulled out just about all those you see in the above photos to find just the right combination of fabrics to make birds. Oh, what a mess!